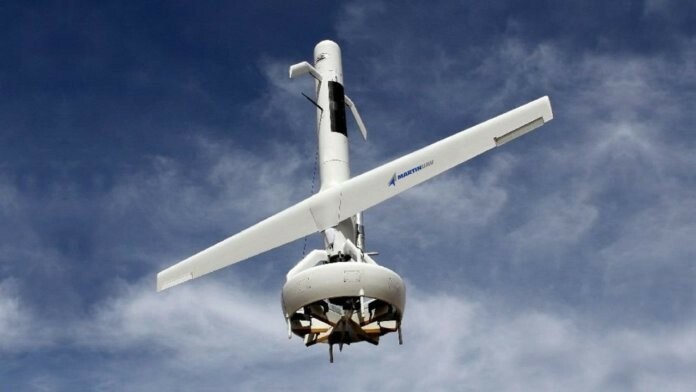 Plano, TEXAS — On the afternoon of June 4, the Martin UAV “V-BAT”, a state-of-the art VTOL Fixed Wing UAV, launched from McMillan Field at U.S. Army Base, Camp Roberts in a flight test to demonstrate its calculated service ceiling. Twenty-five minutes later, V-BAT descended after easily reaching the upper limit of the restricted air space and its calculated service ceiling of 15,000 feet. After landing and a rapid payload change to an 8 lb. turret, the V-BAT was refuelled and relaunched in less than an hour. The second flight was performed at a more tactical altitude and demonstrated the V-BAT’s capability of integrated flight with an Avwatch tracking antenna, successfully conducting ISR missions at ranges in excess of 50 miles. Powered by Hirth Engines: V-BAT Long Endurance VTOL UAV – Martin UAV LLC and the Naval Air Systems Command entered into a research contract to explore extending the V‑BAT’s existing autonomous landing capability. The V-BAT is a tail sitting VTOL fixed wing UAV that is launch and recovery equipment independent. V-BAT can ‘hover and stare’ at a target any time the mission requires and, with an inherently safe ducted fan, can operate close to personnel. You can follow our story on: Twitter | LinkedIn | YouTube.